Speaking at the post-match presentation, Kohli rued the fact that his bowlers didn't perform well in the first six overs. "We played a pretty good game I guess. With the ball, we weren't that great in the first six overs but the guys fought hard in the middle overs and came back well." 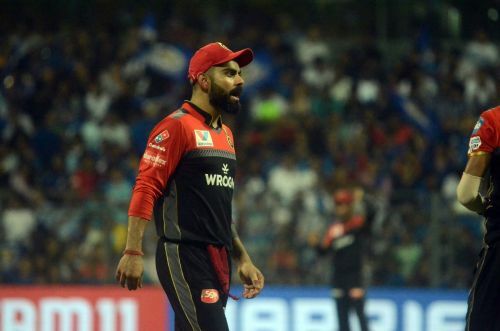 However, the ploy didn't work for the RCB as the left-arm spinner was taken for a toll with star all-rounder Hardik Pandya collecting two sixes and two fours to win the match for his team. Kohli though backed his decision to hand the ball to Negi in the penultimate over. "At the end, we had to take the risk with the left-arm spinner, with two right-handed batsmen. Giving pace was risky, especially with a bit of dew. Unfortunately, it didn't come off." "He's (Moeen) been outstanding. Striking the ball well and bowling with a lot of heart. It's good to see a senior player taking responsibility and he deserves all the credit," said Kohli. Kohli's men have seven losses in eight matches this season and now face the demanding equation of having to win their remaining six matches to provide themselves with a chance of making to the playoffs. "We just have to enjoy ourselves, play the way we did in the last two games. We need to keep our composure under pressure," he said.